Bromine is a powerful and effective sanitizer. 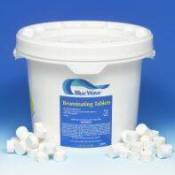 Use it as an alternative to chlorine, especially in hot tubs, spas, and indoor pools. Blue Wave's bromine is pH balanced, so you will find that is less harsh on skin, eyes, hair and swimwear. Bromine is a "pre-stabilized" chemical, so it does not require the use of stabilizers or pool water conditioner, which saves you money and enhances your pool enjoyment. Plus, bromine produces no chlorine odor, making it ideal for indoor pools. Bromine is also perfect for use in hot tubs because its slow-dissolving formula performs better in warmer temperatures. Due to its slow-dissolving nature, Bromine, when used in a pool, must be dispensed by an automatic feeder/chlorinator. Available in 8 lbs, 25 lbs or 50 lbs Tubs. 1 inch Bromine Tablets - 25lbs. 1 inch Bromine Tablets - 10 lbs.